Autonomous vehicles are transforming the auto industry, which is shifting towards a platform model. Christian Umbach Co-Founder and Chief Executive Officer, XapiX Inc. The cost of a copy of a digital asset is (nearly) zero. This is very different from the traditional economics around goods and services, where more assets directly resulted in higher costs. It is this foundation which has given way to an asset-light model of digital platforms, from Airbnb, to Uber, or Apple’s App Store. The goal is clear: a quickly scalable, asset-light global business model. Quickly means not being constrained by internal resources to deploy such business. Much more it is about the ability to set the guidelines for demand and supply to grow without traditional geographical or industrial boundaries. At the core, digital platforms are a space where different actors connect and derive benefits from others participating in the platform. 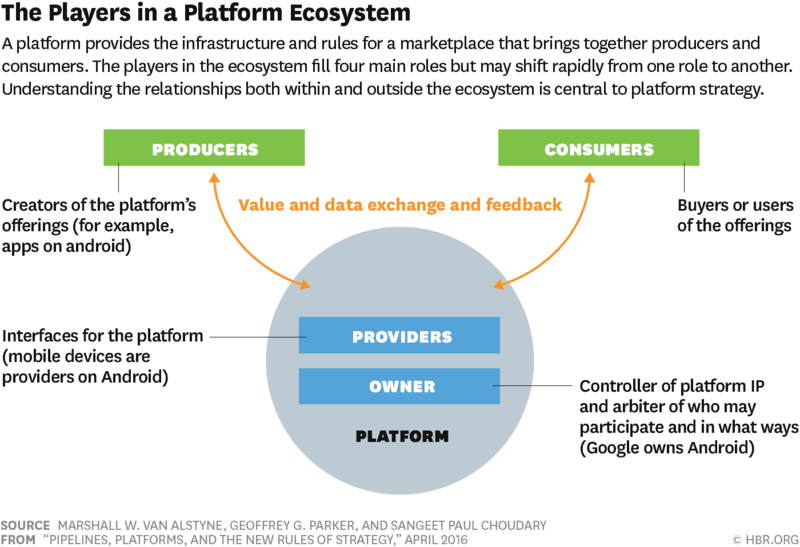 Platforms are the foundation for multi-sided markets, where stakeholders include producers, consumers, owners and providers. The overview from van Alstyne, Parker, and Choudary depicts the role of these players. As companies seek to move towards a platform model, they find themselves challenged with rules of doing business that fundamentally differ from how they traditionally achieved success. Hardware companies seek to add digital services. Human resource services companies seek to add data-driven services. A set of five key areas are critical to designing and operating a successful platform. What is the unfair advantage that a company has over its competitors? This will define the secret sauce, the core of the platform – whether it is the best algorithm to search the web, market access, or unique data, which is being collected by products and services. Finding this strategic core to the platform is key and, for successful scaling, usually bundled with relentless focus on user value and experience. As a platform, you are not the king, but the kingmaker. Your success is the sum of the success of the platform participants. Is data the new oil? Yes, if you think about the oil that is hundreds of miles deep in the ocean. To turn this into value, it is extracted, refined, and transported. To make your data valuable, it needs to be turned into insight (by you or your partners). With insights, value can be derived. A key factor in this is customer data. Europe’s General Data Protection Regulation (GDPR) or similar regulation have defined the rights of end users around their privacy, while restricting activities in certain areas. It also clarifies user rights with regards to data ownership and use. GDPR-compliance has become the de facto standard for many companies priding themselves on data privacy and consumer rights despite the companies’ platform ambitions. It’s not a coincidence that today’s most valuable companies are data companies at the core. Data orchestration and trustable platform governance are critical to allow for commerce at scale. Not only WeChat, Google, and Facebook have launched so-called application programming interfaces (APIs) – essentially data connectors to make data more accessible and interchangeable between enterprises. APIs are a key driver for the economic success of platform companies. Companies like Mulesoft and Xapix provide an out-of-the box toolset that helps companies jumpstart their platform ambitions by overcoming internal legacy IT challenges. 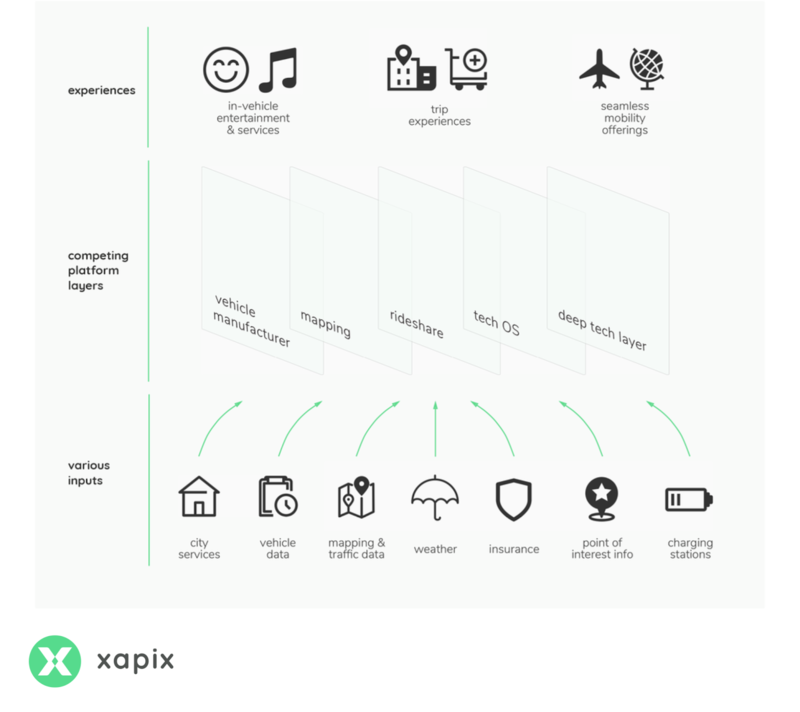 With its lightweight data orchestration engine, Xapix helps companies across cloud, on-premises systems, and at the edge, integrate and orchestrate data – thereby serving as a key enabling layer for companies’ platform ambitions. To build a successful platform model, you depend on the success of others. There are generally two schools of thought on how to achieve a successful outcome. Let’s look at the example of operating systems for smartphones. Google’s Android and Apple’s iOS, open and abundant vs. confined and exclusive. Both have achieved tremendous success with their platform approaches, but the way companies participate and the respective rulebooks differ heavily. How much control do you allow the other players on your platform to have when it comes to defining their own business? Arguably one of the hardest nuts to crack. Digital platform models have enormous economic upside as they come with a low asset base and the ability to monetize multiple sides of the market. Yet, value to individual users differs and hence does their willingness to pay. In the context of vehicles, the value from performance data differs for an insurance company and a city government. Which price do you set? In a multi-sided market with strong interdependencies, how does a price set for one side of the market impact others? Moreover, the target pricing model of a platform in full swing may well differ from the initial start. When jumpstarting platform activity, some element of participation is often times free of charge (at least for a certain amount of time) to help drive adoption and overall platform activity. The most successful platforms deliver a value-add "free of charge" baked deeply into their foundation – or rather, in exchange for user data and activity. For Google, it is searching information; for Linkedin, it is finding and presenting one's professional experience; and looking to legacy companies that are transitioning, for steel-manufacturer Kloeckner, it is their industry platform XOM Materials. 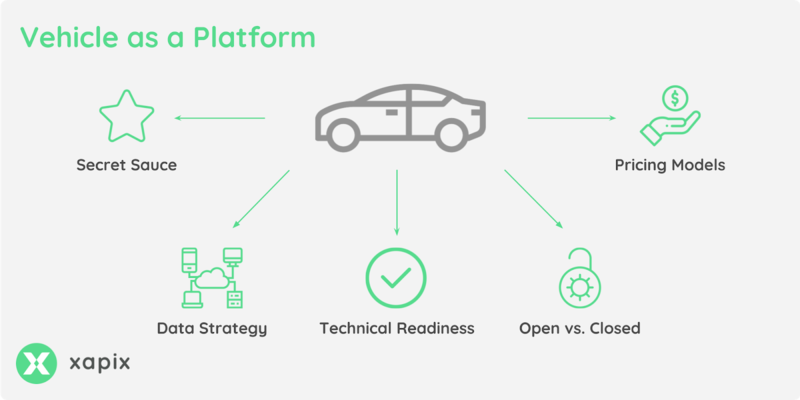 The automotive industry is one of many industries that is shifting towards a platform model. This is being driven by two main factors: telematics units are collecting more sensor data than ever from a vehicle, often around 300 data points, from speed to the status of windshield wipers. Secondly, the emergence of autonomous vehicles, which shift passengers’ attention from the action on the road towards interaction with whatever the vehicle has to offer. This provides a whole new area for other services to deliver value and generate excitement on top of the vehicle platform at the core. Today, numerous car manufacturers from Mercedes to Daimler and GM are making vehicle data available so that it can be leveraged in the context of new experiences. While this excites riders, it serves as the foundation of a new business model, evolving around mobility services for traditional vehicle manufacturers. As Geoff Parker & Marshall Van Alstyne highlight we need to understand the underlying microeconomics in order to understand such new business models. Industrial era giants were driven by supply economies of scale. By contrast, internet era firms are driven by demand economies of scale. These are also called “network effects”. Understanding this transformation means understanding “the inverted firm”. Their key insight is that network effects cause companies to “invert” – that is, to shift production from inside the company to outside. Network effects cannot scale inside the company as easily as outside. There are simply more users than employees. If users are to create value for other users, then they must be aided and rewarded for doing so. Logically, this means companies shift from vertical integration to open orchestration. Platform companies do not merely create value themselves, they orchestrate value creation by outsiders. Companies that open up their APIs have experienced, on average, a 4% gain in market capitalization. That is, for a $250,000 investment, a typical $2 billion company manages to create an extra $80 million in market value. This works by helping outsiders add value to the systems and services already provided by the firm. So, should you develop a stronger platform model? That inherently depends on your answer to the five key areas that we have identified. To succeed in your market, develop stronger influence, and drive the transition of your business in the age of artificial intelligence and robotics, it is critical to approach these questions openly. While you might not have the definite answers to them today, the way you approach them will define the path your organization will take. Professor Marshall van Alstyne (Boston University Questrom School of Business) and Felix Staeritz (Founding Partner of FACTOR10 and Member of the Board of Digital Leaders at World Economic Forum) contributed to this article. Christian Umbach, Co-Founder and Chief Executive Officer, XapiX Inc.